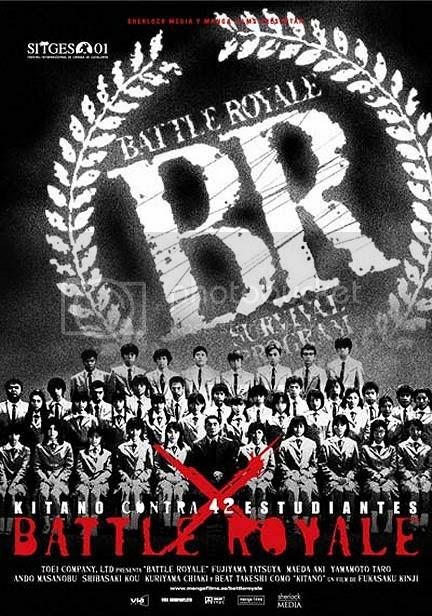 Kinji Fukasaku's modern cult classic Battle Royale doesn't get any points for subtlety, but nor does it need them. Pitched with the insatiable verve of a TV game show and the vacant regret of a Grand Theft Auto video game, this dystopian satire proves cutting even as it bludgeons, standing on the shoulders of voyeurs past (Hitchcock, Powell) as it puts its own gnarly spin on the gut punching methods of audience implication. The Survivor meets Lord of the Flies premise concerns the economically depraved Japan of the new millennium and the passing the Millennium Educational Reform Act, i.e., students throughout the country are kept in line by a yearly lottery that selects one classroom to be ported to a secluded island and forced to collectively fight to the death. (Don't get attached.) The details are learned alongside the unfortunate 15-year-olds selected for this years game. The camera is horrified of what follows, but simultaneously, the reptilian attitudes of survival create an intoxicating contradiction of tones, especially as friendships are tested, love endures, and bodies start piling up. Battle Royale works as its own scathing response, not so much courting controversy as exaggerating for the effect of the statement, ultimately rendering things meta via (among other touches both slight and sprawling) an in-movie sports stat animation device: think NFL turned Death Race. Part teen angst drama, part fork-in-your-eye commentary, part black comedy, part survival thriller. It's less than a masterpiece, but it's well deserving of it's popularity.